Researchers have discovered the first Earth-sized planet within the habitable zone of another star. WASHINGTON (AFP) - The hunt for potential life in outer space has taken a step forward -- an international team of researchers has discovered the first Earth-sized planet within the "habitable zone" of another star. The exoplanet dubbed Kepler-186f was first spotted by scientists using ,NASA's Kepler telescope, according to research published Thursday in the US journal Science. The exoplanet, located some 500 light years from Earth, orbits in what is seen as the sweet spot around its star: not too close and not too far, so it could have liquid water, considered a crucial component to possibly hosting life. "The discovery of Kepler-186f is a significant step toward finding worlds like our planet Earth," said Paul Hertz, NASA's Astrophysics Division director at the agency's headquarters in Washington. The planet is "the right size and is at the right distance to have properties that are similar to our home planet," said Elisa Quintana of the SETI Institute at NASA's Ames Research Center in California, the lead author of the paper published in Science. "We can now say that other potentially habitable worlds, similar in size to Earth, can exist. It's no longer in the realm of science fiction," she said, speaking at a press conference. Kepler-186f is around 1.1-times the size of Earth -- which researchers say is key to predicting the composition of the surface and its atmosphere. When planets are 1.5 times the size of Earth or larger, many of them seem to attract a thick hydrogen and helium layer that makes them start to resemble gas giants like Jupiter or Saturn. 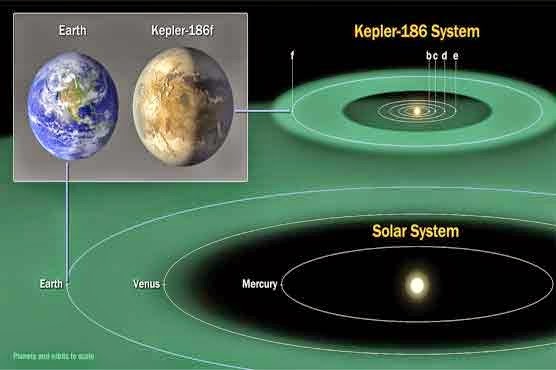 Kepler-186f is the fifth and outermost planet orbiting the Kepler-186 star, right on the far edge of that solar system's habitable zone, meaning the surface temperature might not be warm enough to stop water from freezing. "However, it is also slightly larger than the Earth, and so the hope would be that this would result in a thicker atmosphere that would provide extra insulation," explained San Francisco State University astronomer Stephen Kane, another member of the team behind the discovery. Scientists using the NASA's Kepler telescope first discovered it by tracking "transits" -- shadows that cross in front of the star. The finding was confirmed by observations from the W.M. Keck and Gemini Observatories. But current technology does not allow astronomers to see the celestial body directly or do any analysis to determine its atmosphere or composition. "Some people call these habitable planets, which of course we have no idea if they are," said Kane. "We simply know that they are in the habitable zone, and that is the best place to start looking for habitable planets." Solar systems like Kepler-186, with an M-Dwarf star at its center, may be the best chance for finding a habitable planet, because there are so many of such stars and because many are very nearby. However, because M-dwarfs are cooler, smaller and dimmer than our sun, they interact differently with planets, the researchers said. Kepler-186f is therefore "more like an Earth cousin than an Earth twin. It has similar characteristics but a different parent," Tom Barclay, researcher at the Bay Area Environmental Research Institute at Ames, said at the NASA press conference. And whether Kepler-186f is actually habitable would depend largely on the planet's surface temperature, which would be linked to whether it has an atmosphere and what that atmosphere was like, Barclay explained. Future missions are being designed to characterize the planets around M Dwarfs in more detail, he said. However, because its star is quite dim, Kepler-186f may not be suitable for follow-up studies, Quintana had explained earlier. "However, our research tells us that we should be able to find planets around bright stars that will be ideal targets to observe" with telescopes like NASA's Webb orbiting telescope, currently under construction, she said in a press release. Of nearly 1,800 planets detected over the past 20 years, only around 20 orbit within the so-called "habitable zone" -- and all appear to be larger than Earth, which makes it harder to tell whether or not they are gas giants. The Kepler space telescope, launched in March 2009, observes some 150,000 stars, a few thousand of which have been found to have possible planets.